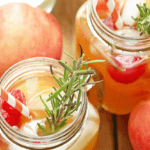 A perfectly sweet and tart Peach Nectar Punch made with Smirnoff No. 21 Vodka and hints of citrus and raspberry and rosemary garnish will be your favorite summertime drink. Peaches scream summer to me. There is no other fruit that makes me happier during this time of year. So when it was time to start planning one of my latest summer backyard barbecues, I knew that I needed to have a peach flavored drink on the menu. That’s when my peach nectar punch was born. This punch is easy going and comforting for casual affairs but aesthetic and classy for more dignified summer affairs. As you sip it, you will imagine yourself on a porch outside enjoying the beautiful weather and summertime energy. It just transports you and your guests to a place of relaxation and good ole times. The beautiful peach flavor comes through with the use of a store bought peach nectar that is already quite tasty but when you jazz it up with Smirnoff No. 21 Vodka (or try the peach flavor for even more impact), a hint of citrus, ginger-ale and sugar for sweetness, it really takes on a life of its own. 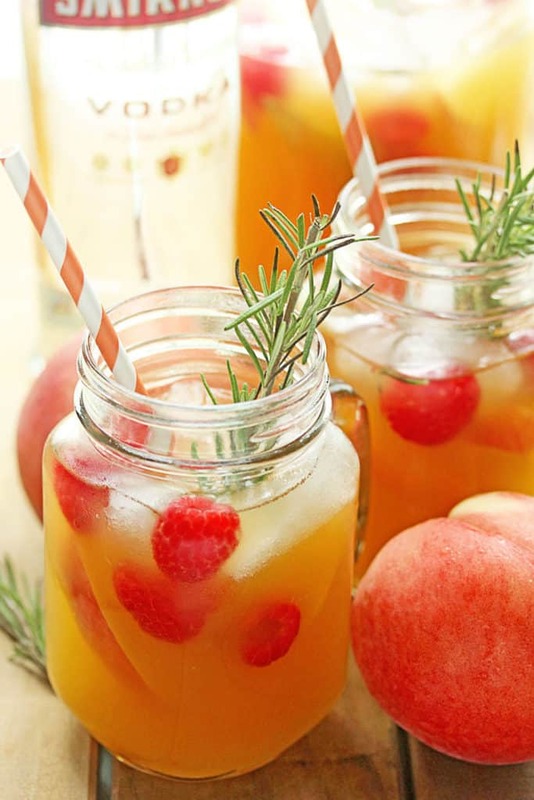 I loved garnishing this peach nectar punch with slices of fresh peaches, fresh raspberries and rosemary. And for an added backyard feel, I served these drinks in mason jars. Nothing makes you feel more at home than a sip of this. If you are looking for adult comfort in a glass, you have found it my friends. In a large punch bowl or bowl, stir together peach nectar and powdered sugar until sugar is dissolved. Next add ginger-ale, lemon juice and Smirnoff No. 21 Vodka and stir together until well combined. 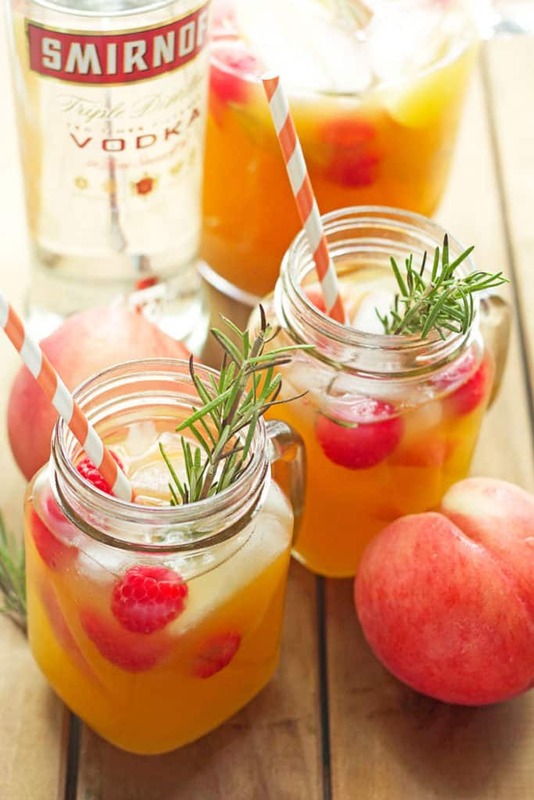 Add sliced peaches, rosemary and raspberries for garnish and serve in mason jars or glasses with ice. This is a sponsored post written by me on behalf of Smirnoff. All opinions are 100% mine. Slide one down the bar for me – because holy moly these look delightful!! Just pinned this beauty!! Great cocktail Jocelyn!! I’d love to have a glass or two of this punch! What a delicious punch! I’m sure I couldn’t stop with just one glass! Made the Peach Nectar Punch yesterday and today minus the vodka and it’s to die for. It taste like summer and it was wonderful. I will be making this for the rest of the summer!! I’m so glad Charlene! Enjoy your summer. I love it too! Peaches are the epitome of summer. I can’t get enough of them this year. Love this cocktail. Pinned! This peach punch sounds amazing! Love the refreshing flavours! Yum! I am hoping to pick up some peach juice tomorrow! I would love to try this! What brand of peach nectar have you used? I cant wait to try this drink! Any local grocery store brand will do. You can adjust the sweetness with sugar if you would like. so refreshing, I love this!! I have pinned, yummed and stumbled this gorgeous cocktail! I would love it if you would link it up to Tipsy Tuesday at Grey is the New Black – a weekly cocktail linkup! 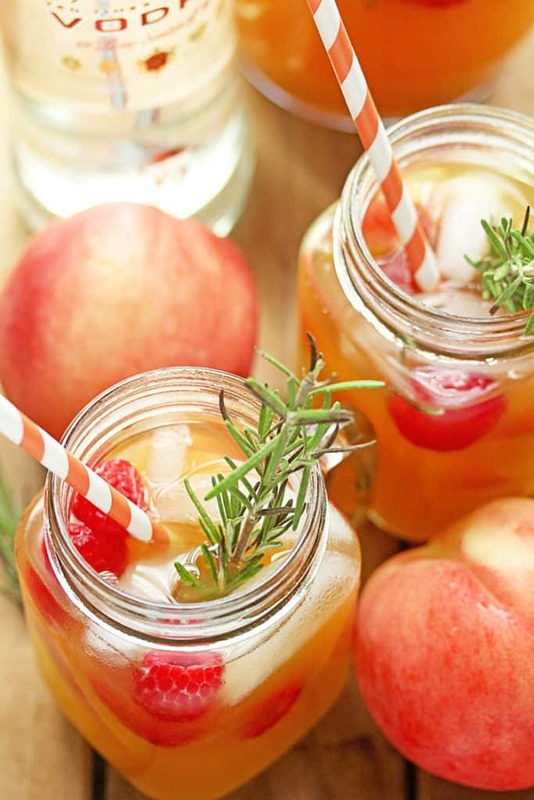 Wow, beautiful drink, peaches are one of my favorites and I love the addition of the rosemary. Thank you so much Celeste!! Pass that pitcher my way!! This looks DELISH! What an absolutely stunning summer drink! I love that you added rosemary sprigs… so perfect for a hot and lazy day! This punch totally screams summer to me! Such pretty photos! Peaches are definitely one of the best parts of summer 🙂 these drinks look so delicious and refreshing! I definitely just discovered what I want to be drinking all weekend long! I love Smirnoff, and this just screams “DRINK ME.” And.. “Drink 5 of me!” 😉 Pinned! What a summery refreshing drink! Totally saving this recipe for when the weather gets warmer here in Australia. I am loving all your gorgeous cocktails lately. This just screams summer to me too. Sounds perfect for this weekend! Cheers! Peaches are just so summery! And this drink looks so pretty and summery too! You’re making me wish I had a glass of this and some sunshine outside! I love my fruity drinks! Same here! The rosemary is delghfl hnk! OK, you need to make more drink recipes because this is KILLER! i agree! It needs to start with this punch! That first bite of peach every summer does set the best tone. And this punch will keep that tone going so well! I love this! I totally agree with this being a good breakfast haha! J,you know how much I love peaches!!! I LOVE this punch. . this is like the epitome of summer right here. Where can I find peach nectar?!!! at any grocery store? Yep we have it in the juice section at our place. So sweet and yummy! I would love to have one of these while sitting on the porch this evening! Such a fun, summery adult beverage! It is such a relaxing drink too! Just in time for the weekend! Pinned! 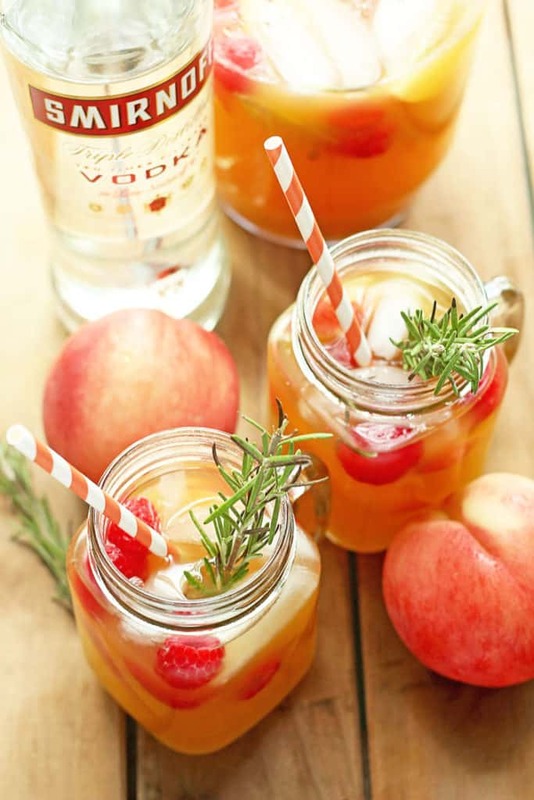 I love Smirnoff and turning it into peach nectar punch looks refreshing and beautiful color. YES please I’ll take one of these (or two… or three…) Beautiful photos, too (as usual)! Hahaha three sound about right. Thank you hon!